This story was filed by CBS News reporter Sarah Carter, covering the World Cup in South Africa. Fans liken the sound to a herd of stampeding elephants, or the drone of thousands of bees. No matter where you are in South Africa, you hear the blast of vuvuzelas almost non-stop. The long, thin plastic horn is the talk of the World Cup. Blow it hard, blow it soft, the pitch doesn't change, only the volume. Critics say it goes beyond annoying and kills the festive atmosphere at the games. International football fans are known for their rowdiness -- but it's usually inventive chants and cheers. The vuvuzelas have muted even the loudest vocal supporters. Dr. Katijah Khoza-Shangase, a professor of speech pathology and audiology at the Univeristy of Witswatersrand in Johannesburg, told local media: "We are not saying, 'ban the vuvuzelas.' The vuvuzela is part of the festivities of the game, it is part of what makes the soccer in this country, but people need to be aware that they need to just wear ear protection." World Cup Clamor: Should Vuvuzelas Be Banned? The vuvuzela first hit the news at last years Confederation Cup in Johannesburg. Knowing the World Cup was around the corner, the South African Association for Audiologists set up a study to measure the damage the vuvuzelas could inflict. The study found the intensity levels vary from 113 decibels to 131 decibels, and exposure over an extended period of time could cause noise-induced hearing loss. Ironically, the vuvuzela has been approved by FIFA, the International Football Association, but ear plugs aren't being handed out. An anti-vuvuzela earplug is flying off the shelves at many local shops. The earplugs, dubbed the "Vuvu-Stop," claim to reduce the sound by 31 decibels. The label on the back of the packet even says, "Uses include football, rugby, or for couch potatoes to block out your wife's moaning," according to local media. After receiving hundreds of complaints, the BBC is considering offering "vuvuzela-free" coverage via its interactive viewing service for soccer fans in the U.K. The downside, however, is that almost all crowd noise -- i.e., atmosphere -- would be muted along with the vuvuzelas. World Cup Local Organising Committee chief executive Danny Jordaan has threatened to ban vuvuzelas if fans blow them during the singing of the national anthems, announcements or speeches. 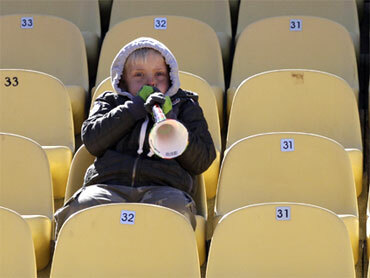 For now, a committee spokesman says the vuvuzelas will stay in the stadium. That comes as welcome news to most South African fans, who continue to buy and blow the horns. "Every country has its own unique way of celebrating," says one woman dressed head-to-toe in South Africa's national "Bafana Bafana" team colors. "Ours is blowing vuvuzelas."